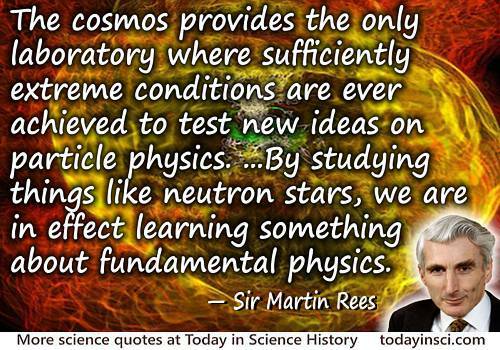 It’s becoming clear that in a sense the cosmos provides the only laboratory where sufficiently extreme conditions are ever achieved to test new ideas on particle physics. The energies in the Big Bang were far higher than we can ever achieve on Earth. So by looking at evidence for the Big Bang, and by studying things like neutron stars, we are in effect learning something about fundamental physics. From editted transcript of BBC Radio 3 interview, collected in Lewis Wolpert and Alison Richards, A Passion For Science (1988), 33.